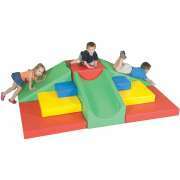 Purchase Soft Play Equipment for Your Preschool: Shop Now! 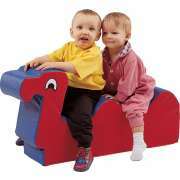 What furniture can help children develop motor skills? Cushy soft play equipment encourages little ones to use their gross motor skills and try new things with the reassurance of soft landings. 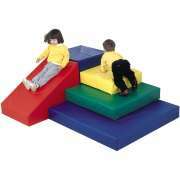 These cozy, squishy soft play forms are just begging to be climbed, jumped on and enjoyed by all. Hertz Furniture&apos;s huge selection of soft play toys, cushions and riding toys will make an exciting addition to any classroom or preschool gym. 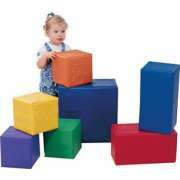 If you are looking for a way to liven up an early-childhood learning space in a stimulating and educational way, these are an excellent choice. How do you clean vinyl soft play equipment? With many little ones playing and exploring in your learning centers, it can be difficult to maintain a clean, germ-free environment. 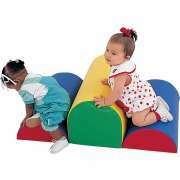 Soft play forms that are made of fabric can easily become stained and absorb germs. Unlike fabric, vinyl will not absorb stains or germs. It can be quickly cleaned on a regular basis, or in the event of an accidental spill. Easy cleaning is important in an environment where babies, toddlers and preschoolers play in close proximity because it prevents germs and colds from spreading. 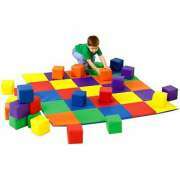 How can I make an indoor playground? 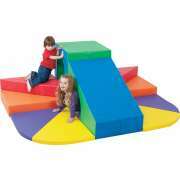 Create your very own indoor playground with a set of climbing shapes. 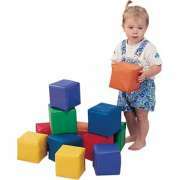 Our great selection of large shapes can be arranged in a myriad of ways to promote problem-solving and gross-motor skills development. Children can choose to play with individual soft play pieces such as tunnels and slides, or practice running, climbing and tumbling through a whole obstacle course. Children&apos;s Factory soft play climbers can be fastened together safely in a number of different configurations. Caregivers can make obstacle courses that are progressively challenging or focus on particular skills. Young learners will just love coming into school in the morning to see the new courses that have been created just for them with indoor soft play equipment. 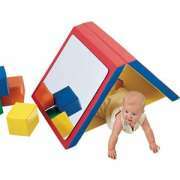 Alternatively, little ones can express their creativity and take initiative by designing their own challenges. What should I get for tummy time in my daycare? Babies need to spend time on their tummies and lie on the floor in different positions in order to develop important coordination skills and strengthen particular muscles. 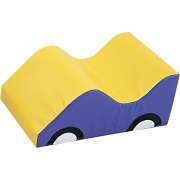 Colorful cushions enable babies and little ones to rest or sit on the floor comfortably. They come in a wide selection of fun animal shapes including ladybug, bee, caterpillar, turtle, alligator and more. 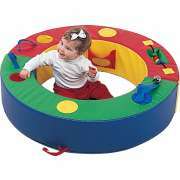 Floor cushions provide the perfect venue for tummy time or a bit of calm relaxing. 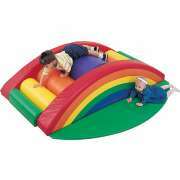 A cushy soft play ball pit offers an enclosed padded space that can be tons of fun. Soft padded walls keep lots of colorful balls enclosed in the pool as young ones practice grasping, throwing and distinguishing colors. 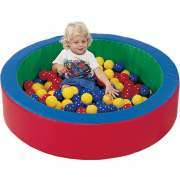 Ball pits encourage children to explore textures and play together. How can I enhance my soft play area? 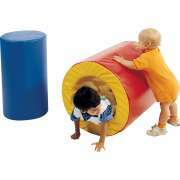 It&apos;s good to think outside of the box when choosing soft play equipment for early childhood learning centers. There are many more options in addition to the classic slides and tunnels. 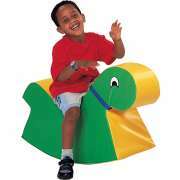 Soft riding and rocking toys let little ones feel like the big guys with their very own vehicles. 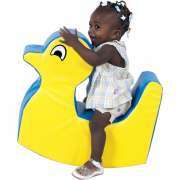 Unlike hard plastic toys, they mold to fit the child for comfortable sitting and support. They can be enjoyed individually or in groups as children rock and ride independently or race and practice steering around. 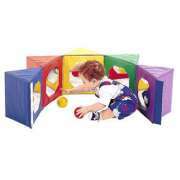 For some extra fun with soft play toys, consider adding mirrors to an obstacle course. Young students will just love watching themselves as they maneuver around and learn to conquer new challenges. As they observe their own movements, babies and toddlers will develop greater awareness of their bodies and improved spatial sense. 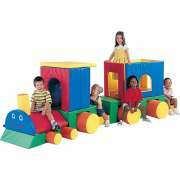 Hertz Furniture&apos;s soft play equipment will fit right into your preschool or daycare classroom. Whether you have a whole gym to fill or just a bit of extra space for a new soft play tunnel or slide, we have a number of fun educational pieces that are sure to spark the curiosity of your little explorers.